It’s become one of those years for Blake Wharton. He started the year on the short list of contenders for the East Region Lites Title—we were calling it the Little Five in homage to the Big Five in the SX Class—with Wharton joining Justin Barcia, Dean Wilson, Ryan Sipes and Blake Baggett on the could-be champions list. He was in contention at the Houston opener, closing on the Barcia/Wilson battle until Sipes got into him and knocked both off of the podium. He appeared to have the Atlanta win in hand until he crashed. More misfortune followed—heat races crashes leading to Last Chance Qualifiers and bad gate picks. 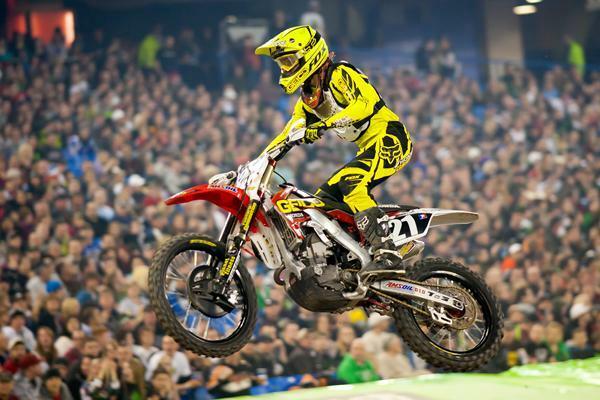 Then he crashed in the whoops while fighting for a podium last week in Jacksonville, and hurt his shoulder in the fall. Wharton got his first podium of the year in Toronto. Wharton may be headed for shoulder surgery soon, but he showed up in Toronto anyway to try to turn his season around. He got a good start, slammed Sipes to get some revenge for Houston, and hung on for his first podium finish of the year. Wharton is not going to win this year’s Lites East title. He may not get a race win and in fact may be headed out of the whole series if he elects to put his shoulder under the knife. Tough season all around. There may be a silver lining, though. Under AMA rules, if a Lites rider scores 100 points for three-straight years, he is automatically bumped into the SX class for the next season (see Austin Stroupe for reference). Right now Wharton stands at 89 points, and if he does have to miss races due to shoulder trouble, it could end up saving his career. Sometimes a year can get so bad, it actually turns out good!